beautiful things from their 200+ sites . 1. Leave a comment on this post ( Busy moms can jus drop a Hi! blog updates in ur mailbox. (This part is optional ). prizes can be only delivered at a US or Canadian address. the certificate to his/her friends /relatives in US / Canada . the comment soI can contact you if u win.. Good Luck !!! I have been following your blog in recent times and simply admire your creativity. I'm planning to try out some cuties from your blog to impress 3 year old !! I have blogged about your giveaway. Please follow below link. Do visit my blog when you find time and let me know your valuable comments !! what a great and full of inspirations blog! Hi, Smita, I love your guava flowers today, and so easy to make! I can see what kind of food each part is made of. You haven't posted in awhile! What a nice surprise the giveaway is! You know I have already been signed on as a follower for awhile, so sign me up! Hi Smitha, loved your presentation. I am one of your follower. When an article about you published in EENADU, I felt so proud that I know you and your work before reading that article, thanks to blog world. Let me try my luck at this giveaway. will post about this in my FB. I've been your happy blog follower since sometime now .Your wonderful art work with food and the fabulous pics never cease to amaze me !! you are super talented.Will surely try out some of your techniques very soon.Keep up the great work .Will put a link about this giveaway on my blog www.happyhealthyfuncooking.blogspot.com. Hi there! I do lots of fun meals with my kids. (check them out at my blog!) and I love your guava flower. Too fun!!! Sounds like a wonderful prize! I would use it at their toy site towards a step 2 roller coaster for my daughter for her birthday. hello smitha, i have added your blog to my readers list and admired the way you make food as fun for your kid. your creativeness and imagination are simply superb. keep rocking. I'd love to get a Dualit Immersion Hand Blender. I just became your follower, also! These guava flowers look really cute. Great giveaway! I'd love to buy flannel sheets for my kiddos if I win! Thanks! Beautiful creation.. I always loved your food art..
Hey, would love to participate in the giveaway :):) and here I am, delicious looking guava. Glad to participate in this giveaway dear. Hi, you are so creative. I would like to own a Zwilling JA Henckels Twin Pro"S" 4" Decorating Knife from CSN. Thanks for letting me participate. I hope I can win then it will be a dream come true for me. hey smita.. love your work as u already know:D not been able to follow much but indeed u r doing a grt job... keep at it!! love ur blog...i love all those creations with the food u make. beautiful!!! I love the guava flowers! It's so nice when food is fun:) I just gave away a bento lunch thermos from CSN and would dearly love one myself! As always another lovely gem from as a result of your creativity. A quick question though, what have you used to make stems? Is it bell pepper or green colored licorice? I love shopping at CSN, they have wonderful selection and i love their home and baby stores. Love the idea of using the apple slicer,looks so beautiful too. Thanks for stopping by my blog, yours is is so cute! What a great idea for a blog! I have picky eaters but they are 13&14 guess I can see what putting a smile on their plate would do! Guava flowers look beautiful..you are so talented! Wow...sooo cute flowers...u are really creative dear! About the giveaway...I would love to buy a Dutch Oven from CSN! Thanks for commenting on my blog. 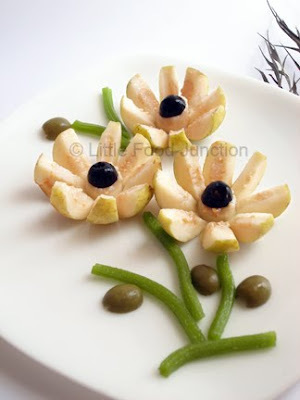 Those guava flowers are so pretty and creative! I never would have thought to do something like that. Creativity at its best! When I prepare food for my son, I try and remember your presentations and serve it to the lil master :) You are doing an awesome job and leading us to think more "out of the box"
Hi smita, didn't come here for your giveway!, :)), I sent your link to my 2 sisters and few of my friends, hoping they would love your blog as they have small kids, Mine are too grown up!, thanks for your lovely comments too.. I have been following your blog and admire your talent and creativity. Since feeding these little ones can be such a challenge, help in any shape or form is always great. as usual beautiful presentaion..actually I love Guava...! I would like the Bay Flip Flop in Flyn Brown by Franco Sarto from CSN and every single one of their items for the kitchen. I love cooking and having all the gadgets I need for every recipe. Beautiful creation ... Creativity at its best !!! You know that I have been following you for quite sometime.Those Guava Flowers look gorgeous. Awesome pics, Smitha!!! Have fun!!! My first time here...amazing give away..love the guava cut up in to flowers...lovely lovely presentation..am not good in presentation..learning only now! !new to blogging as well..Keep up the great work!! Stumbled on ur blog thru Ragini's. Loved it. I wish I could lay my hands on some guava, those flowers look so good! I would love to get the Kennel-Aire Burgundy Wire Dog Kennel for my pooch! Blogged about it..Check it out.. I'll add you to my google reader! Very creative blog you have here.. really amazing talent! Fun meal times usually take place when I let the kids help with the cooking. They really seem to enjoy eating things they have helped to prepare. Another thing that makes dining fun is to use special things like a tea set that was Granny's and has been handed down. Telling family stories that go with those special items makes the meal and the memories even more special. I'm a new follower. You have a great blog! Hi-thanks for the giveaway! I'd like to buy the Certified International Bubble Ice Tea glasses in cobalt if I win! I would love to buy some paintable beadboard wallpaper they have at the CSN store. I have a few uses in mind and I think it would be lovely. i'm now following. i've got a toddler at home so i do try to be creative in the kitchen- especially with baking. thanks for the giveaway! I've seen CSN on other sites. Would like to try their stores. My girlfriend would like your site. I'll give her the link. All photographs & text © Little Food Junction 2009-2018.Do not use thecreations for any commercial purposes without written permission. If you are linking my creations at your blog pl make sure not to remove any watermarks or make any other changes in the pic.Corporate giants & organizations pl do not use my images on your website /instagaram/ FB/twitter page without my written approval. From food art to food styling and recipe development - life has always been full of new thrills, adventures and challenges . Photography ,Books , Art, Crafts , Cooking n baking are important limbs of my life while God ,guardian angel, life ,love n voice of heart are somethings that I totally believe in. -Right from the school days wenevr in a fix i ponder over the immortal lines of Robert Frost - Two roads diverged in a wood, and I - I took the less traveled one ,And that has made all the difference - meditate and get answers to all my worries . Join me on my journey to end the mealtime wars & add fun to the dining table. Feel free to drop me a line for any blog queries / comments.